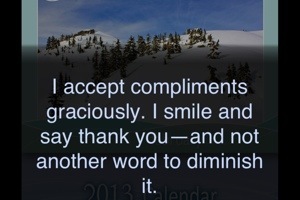 I always say something negative to contradict the compliment: why do we do that? Been there, done that too, Leigh Ann! Here’s an antidote: tell that part of yourself to keep quiet, that IT IS SO TRUE. It doesn’t matter if you really believe the compliment or not. Forget that consideration. Just accept it! That is a hard one. I still have to consciously tell myself just say thank you. Yes, Yes! It can be SO tough! But we really DO deserve to be complimented. We’re all trying on this road of life. I appreciate your commenting on the blog. Are you a world famous philosopher or something? I LOVED that answer. And yes, speaking joy into others’ lives is transformative for both speaker and hearer! Thanks for your comment.